Thanks to Novus Ordo Watch for just reporting the following to add to our meditations during the Sacred Triduum. Here is the latest Francis interview with Antonio Scalfari. If you forget for a moment about the "traditional community" often money-induced polemics, this is really scary. What does he mean by a "new species." is that where he is "leading" the "Church"? Maybe we should start asking what are the ultimate objectives of the Modernists? Maybe then we would understand what has been going on these past 60 years. No Hell. Well doesn't that fit in nicely with all the post Vatican2 sense of sin and evil. "Dare we Hope that all men will be saved," Von Balthasar, and the hope that though Hell exists no one is in it. 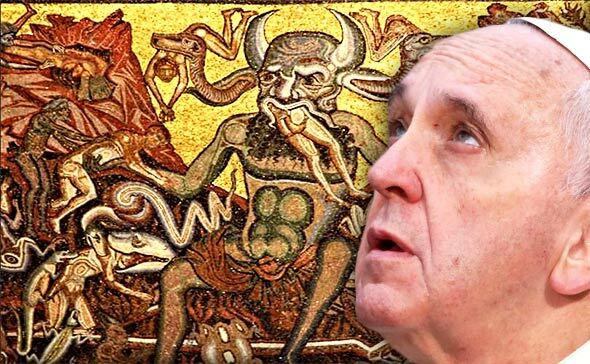 We can all hope that by contemplating the occult mysteries that the Catholic Faith has so distorted and mangled and opposed and relying on endless mercy we can all contemplate the luciferian god in the "Celestial Lodge." No hell = no Satan. So who tempted Christ in the desert? I have to tell you, I'm really tired of all of this. We've been going around in the same circle since 1965. The excuse the Vatican pulled off the shelf for this latest Francis nonsense has been used before - I think with Benedict. Not sure. I can't remember everything that's happened. I was born long before the council, and I really am weary. What a mockery of Our Lord's crucifixion and His Sacred Passion and Death. He did all that for ... what? Has anyone pulled out the pope is surrounded by enemies of the faith yet? I notice they're using that one for Trump since it worked so well with Catholics. Sorry for my tone. I really am weary. God bless all of my staunch Catholic brothers and sisters! Heaven, please God, awaits!! What are we training exorcists for? This new species idea is of course diabolical. See Genesis 6. The Judgement of the Flood came on pre-emmanently because of the attempt by the fallen angels to create a new hybrid species with man - the so-called "Nephilim." Many UFOlogists believe this "interbreeding" is now taking place, which Marzulli believes is the same demons (of the air) - which are bringing about a "new species" of hybrids, added with all kinds of satanic lies as if they will be "an improved model of creation." I know it sounds far-fetched, but read St Jude in the New Testament and 2nd Peter: its all about this attempt by Satan to "interbreed" with our homo sapiens women who are beautiful and they DESIRE them. 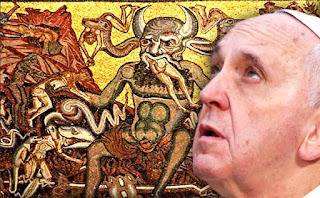 So it REALLY gives me the creeps to hear the arch-heretic & apostate Bergoglio talk about God (which God is his? Plus it ignores - or rather DISBELIEVES the Holy Incarnation!) fashioning a "new species" that might be better than mere homo sapiens ~ us!!! Perhaps, a good imprecatory "turn or burn" prayer is long overdue for Francis. I think the prayer has been very effective for some abortionists. Another gift the Theory of Evolution brings to the Church. They might as well just say Hell evolved into Heaven over billions of years. All this other talk about us becoming God also smacks of Kaballah. Novus Ordo Watch = New Order Watch. Novus Ordo means New Order. Hello? It is of the false new fake church. Frankie converted by the Jehovas Witnesses? That's a good one. Frankie is a devil worshipper. Guess who Jehovas Witnesses worship? The devil. I threw them out of here. Apparently they targeted me because I have blessed Mother's statue and grotto in front of my house. Next time I'll have them arrested for trespassing on posted property.